This event is for Shelbz Riveria, her son Huntar and their family. Any and all support / publicity / blogging will be very appreciated. Shelbz is a wonderful and kind member of SL who is now facing every parent’s worse nightmare as her son has been diagnosed with cancer. Look for information in Inspire about the procedures, how to overcome it, symptoms and treatments. As of last count (sometime Sunday) there were over 50 vendors in this event which has been pulled together in just a few short days by some amazing friends of Shelbz. ALL FUNDS RAISED WILL GO TO SHELBZ 100%! In addition to shopping there will be a day of musical celebration later in the week, with multiple DJs all donating their time / tips to the cause. 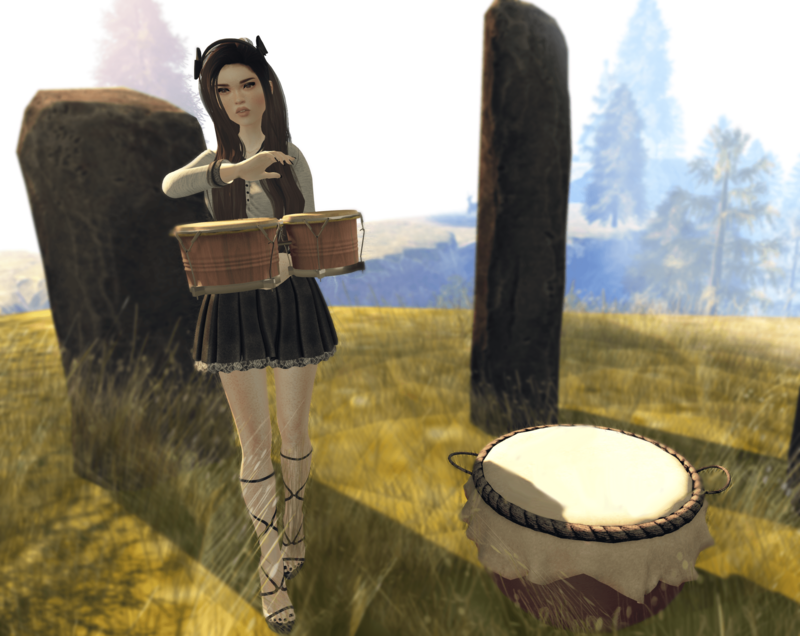 My good buddie Oblee has created a line of drums in SL! Click here for videos & more information on how they work & why they are unique! Two more of my buddies have just finished designing a new sim. Devils Point was put together by They Ellison and Zakk Lusch. Be sure to check it out, there are a ton of photogenic spots around the sim where you can take gorgeous pics! photos taken at Devils Point. poses by elephante poses – alana. I have been meaning to blog this look for a while now, but I have not been well. I’m hoping I’ll be back to feeling like a normal human being in the next week or so and then it will be back to blogging as usual. Yay! See all the details for this outfit below! poses by elephante poses – hello. photos taken at SL KPOP CAFE.